Fed up and out for revenge, Nyx comes to Minneapolis following a tip that his aunts have set up a business there. His goal to bring down his mother's killers and retrieve the thread of fate that has trapped him in the body of a twenty year old unable to age or die. Egalley courtesy of Orbit Books/Hachette Book Group via Netgalley in exchange for a fair and honest review. Nyx Fortuna is the son of Lady Fortuna murdered at the hands of her sisters – Fates. Nyx sets out on a mission to avenge his mother and find an end to his own immortality. Tired of being constantly on the run, he is finally ready to face his ominous aunts, who have hunted him since his mother’s death. But, to put his plan in motion, Nyx needs to get close to his enemies. Thus, he comes to Minnesota [of all places to find Greek mythological figures], where the Fates have taken residence and spawned a business empire, where among other things they produce the nectar of the gods, banned by the magical underworld. The nectar, also known as ambrosia can help prolong the life of the mortal, with an exception of unfortunate side effect of making one go mad and die an agonizing death. But then, have the Fates developed a new formula? And what’s with the sudden appearance of the girl – Elizabeth, who is a ringer for Nyx’s dead ex-girlfriend? “I don’t know how to say this politely,” I said. “But get lost.” A strange girl who looked like my dead ex? That smelled like trouble. (Kindle Location 100). 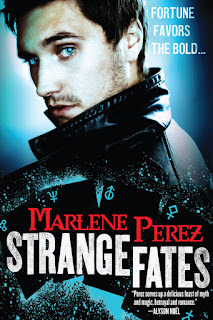 From unexpected case of insta-love or rather insta-lust [although Nyx would insist otherwise]; to his undercover work at his aunt’s company, moonlighting as a store clerk, and looking for Elizabeth’s missing brother, Nyx’s hands are full. He spends most of the novel being obnoxiously bitter, self-pitying and paranoid of everyone and everything. And, while he swoons over Elizabeth for the most part, he still manages to sleep with a nymph; who, being described as seductive but wicked creature is nonetheless much more helpful to Nyx’s cause than most others are. After that incident I lost all hope at liking either Elizabeth or Nyx. Main romance down the drain, the main villainesses did not offer much consolation either. The Fates were not all that Nyx made them out to be. “So far, the most ominous thing about my aunt’s company was the high-calorie snack choices, but the day was young.” (Kindle Location 1212). Indeed, the day was young but it clearly didn’t make much of a difference. It seemed that the Fates took the back seat to this story. They were absorbed enough in their own dealings to truly notice the nuisance of presence of their only nephew, aside a brief encounter towards the end, where they tried to coerce him into joining the “family business”. Not so vicious after all? And if anyone expected any of the questions answered you will clearly have to stay tuned for the next installment or two, because none were uncovered here. I doubt I will be picking up the next one, but if you are keen on it, check out the second book in the series – Dark Descent which is tentatively scheduled for December 2, 2013 release. Hello, new follower here :) I love the look of your blog. I followed you on GFC and blog lovin and I look forward to reading your reviews.